The Ford Mustang is a classic car and while its very existence was put into jeopardy several times throughout the years, today the 2009 Mustang still stands for great looks, a muscular engine and top performance. 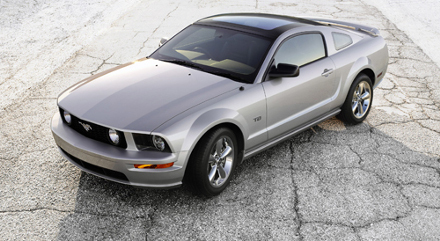 For the 2009 model year, Ford is offering a variety of Mustangs to fit almost any budget and performance level. There are actually three flavors of the Mustang for 2009 including the V6 cruiser, a V8 GT with extra muscle and a soon to be classic Mustang Shelby GT500 Cobra Coupe. For those that are looking for a sporty vehicle with plenty of pep and good styling, you will be hard pressed to find a better cruiser than the 2009 Ford Mustang V6. This level of Mustang comes with a V6 4.0 liter that produces an admirable 210 horsepower. There are two levels of trim; deluxe and premium and this base model goes for a modest $22,000. It should also be noted that the Mustang V6 gets decent gas mileage averaging about 27 mpg highway and 17 mpg city. The 2009 Mustang V8 bumps up the engine to a V8, 4.6 liter engine that produces 300 hp, definitely enough to get your thrills. It also comes in two trim levels; deluxe and premium and MSRP is currently is just below $30K. While the Mustang V8 offers lots of horsepower, the gas mileage is decent at 23 mpg highway, 15 city. The Shelby is back and with a supercharged 5.4 liter V8 engine, you can expect to enjoy all 500 horses this Mustang produces. It should be noted that the Mustang Shelby is a rear wheel drive just like the classic muscle cars and is sure to be a hit this coming year. While priced out of most budgets, it is still quite a good value with an MSRP in the mid $40K region.